Olivier Giroud has insisted that he wants to remain at Arsenal despite rumours linking him with a move away from the Emirates this summer. With Arsenal set to land coveted Lyon striker Alexandre Lacazette in the next few days, talk has intensified of a transfer for Giroud, with Everton noted as a possible destination for the Frenchman. Giroud has been a hugely divisive figure at Arsenal despite maintaining a healthy goalscoring record at the club since moving from France. Some Gunners fans have criticised his laboured play at times and his inability to score when he starts in games. 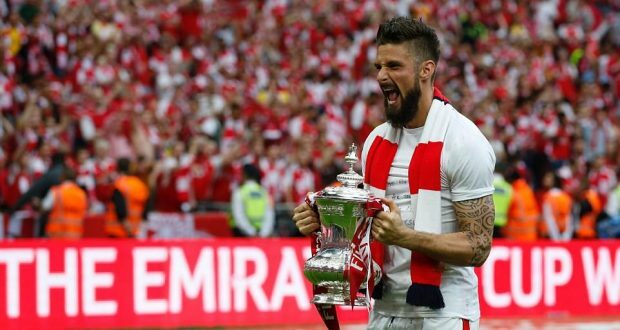 However, Giroud told the club website that he wanted to ‘carry on his good journey’ and aims to remain with the Gunners until at least the end of his current contract. “I won a few titles in my career, that is an important thing, but there is another thing which is important for me. And that’s the people remember you as a loyal warrior on the pitch – that you always give your best for the team,” he said.